For the last few years, photographer Jim Goldstein has challenged other photographers to blog about their top photos of the year. He posts links to the blog posts of participating photographers on his blog (Click Here for his blog). It's a fun project I look forward to every year, where I get to reminisce about my adventures. 2014 was another great year for beautiful scenes in the Tahoe area. Really, I don't think Tahoe has ever had an un-photogenic year. 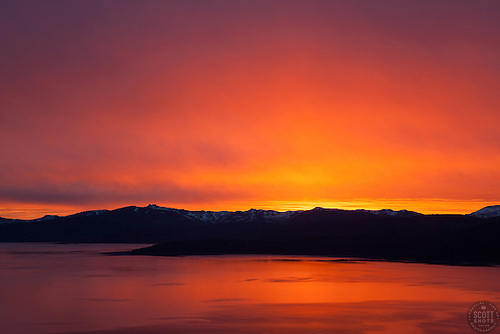 Below are my favorite ten Tahoe photos of the year. I hope you enjoy them! 1) Perhaps my favorite photo I shot this year. The sky above Donner Lake just exploded with color that evening. 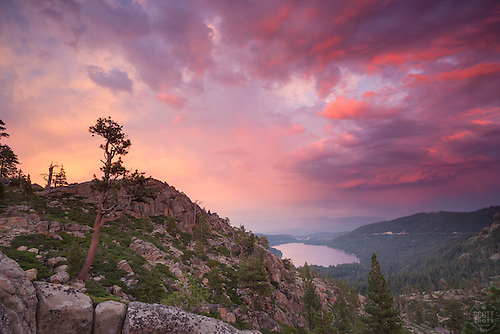 "Donner Lake Sunset 21" - Photograph of a colorful sunset above Donner Lake in Truckee, California. 2) Just another beautiful sunset at Donner Lake. Yes, the sky really was that color. 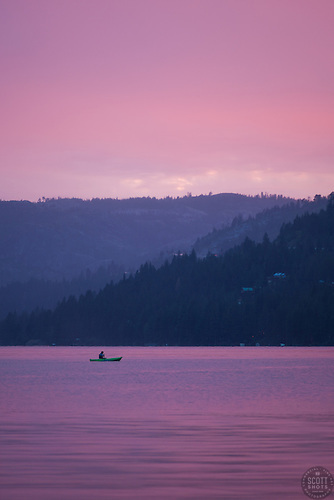 "Kayak on Donner Lake Sunset" - Photograph of a kayaker fishing on Donner Lake at sunset, shot from the East end of Donner. 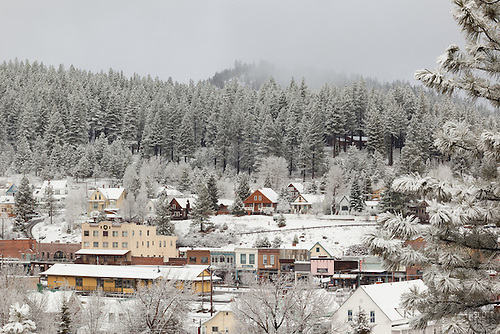 3) Truckee, California sure does look good in white. Photographed from the hillside near Cottonwood Restaurant. "Downtown Truckee 14" - Photograph of a snowy Downtown Truckee in the morning. 4) You can't go wrong with a classic view of the Truckee River in Downtown Truckee, California. However some mornings are more photogenic than others. 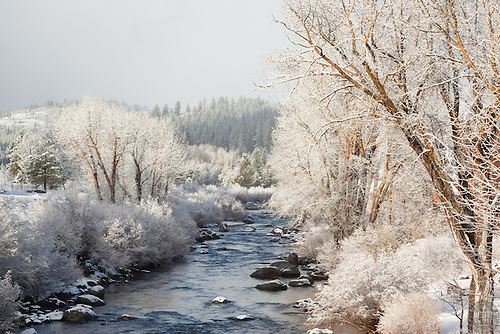 "Snowy Truckee River 3" - Photograph of a snowy Truckee River shot in Downtown Truckee, California. 5) I drove all over town this spring day, looking for the perfect snow covered flower. It turned out my favorite was a daffodil in my front yard. 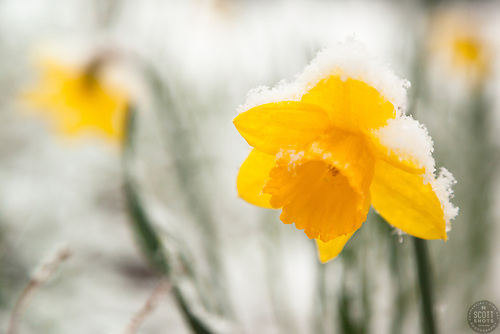 "Snowy Daffodil 1" - This snow covered Daffodil or Narcissus flower was photographed in Truckee, California in the spring. 6) I shoot this shack just about every year in the Fall. This year, I decided to use my tilt-shift lens to do something different. The tilt-shift is how the soft focus effect is achieved. 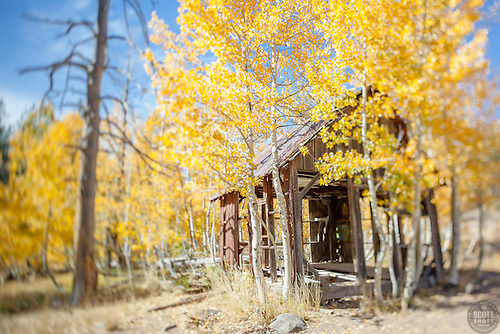 "Shack in the Aspens 7" - This old shack and yellow aspen trees were photographed in the Fall near Brockway Summit in Tahoe. 7) Finally! I've been trying to get a good bear shot for years. I finally got a cool shot of a black bear eating a Kokanee Salmon. 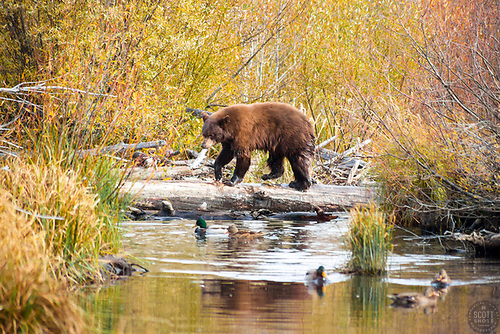 "Black Bear at Taylor Creek 1" - This brown colored black bear was photographed with a Kokanee Salmon in it's mouth at Taylor Creek in South Lake Tahoe. "Sunset at Lake Tahoe 30" - Photograph of a orange and yellow sunset at Lake Tahoe, shot from near the fire lookout above Crystal Bay. 9) Kings Beach, Lake Tahoe has been providing photographers with some unique opportunities this year. Visitors have been creating tons of cairns, or rock piles, giving the shoreline a fun look. Mix that with a beautiful sunset and magic happens. 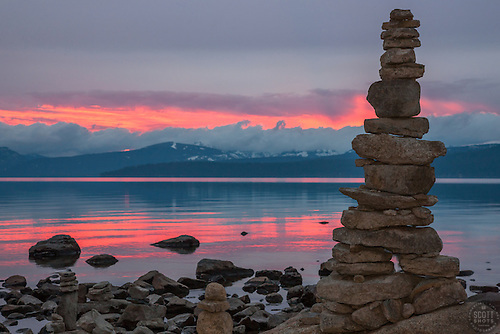 "Cairn at Lake Tahoe 1" - This cairn or man made stack of rocks, was photographed at sunset in Kings Beach, Lake Tahoe. 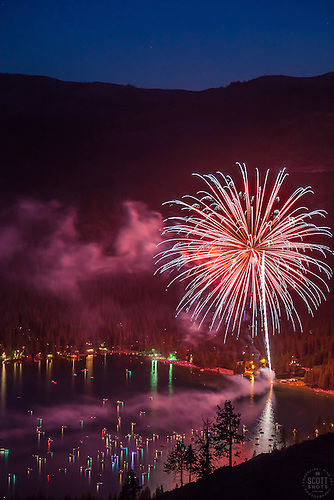 10) The grand finale of this years top ten Tahoe photos, a fireworks show above Donner Lake in Truckee, California. Bonus, my wife and son were with me for this one. "Fireworks at Donner Lake" - This fireworks display at the West end of Donner Lake was photographed from a mountainside on July 4th. The photos above are all available to purchase as fine art prints. Click on an image for more details. Digital downloads, and photo gift items are also available.